All intestines are separated precisely from gizzards and slip out via an incorporated chute. 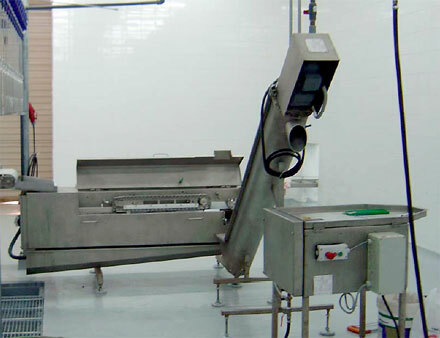 The gizzard is transferred to the splitter knife and the washing position, to where it then moves to the peeler station and the gizzard outlet chute. The gizzard harvester should be placed in the evisceration section along with the heart and liver area. This enables a continuous production process, saving manpower and transfer time. One of the most important advantages of our advanced poultry processing technology has been based on optimum yield during the process. The gizzard harvester also ensures excellent result at highest quality. Reliability and long distance operation are doubtless. washer, giblet chiller and giblet pump / transport system.